Salad: european cucumber, sugar plum tomatoes, and chopped red onion tossed with a dressing of apple cider vinegar, celery seed, salt, pepper, and olive oil. Sandwich: sourdough smeared with hummus, dry salami, sliced mushroom, pecorino romano, sliced jalapeno, red onion, sliced garlic… panini pressed or baked open faced at ~350°F until cheese melts and garlic browns then topped with sliced avocado and tzatziki sauce (greek yogurt, cucumber, dill, garlic). My friend is a vegetarian and this would be a great summer menu for her, minus the salami. I’ll have to pass it on to her when the cukes/tomatoes start coming in season. I agree, it would be good as a veggie sandwich too. Celery seed is a great ingredient! It’s only 7 am here and already I want lunch! Yummy :) Never would have through to do hummus, salami, and avocado together! 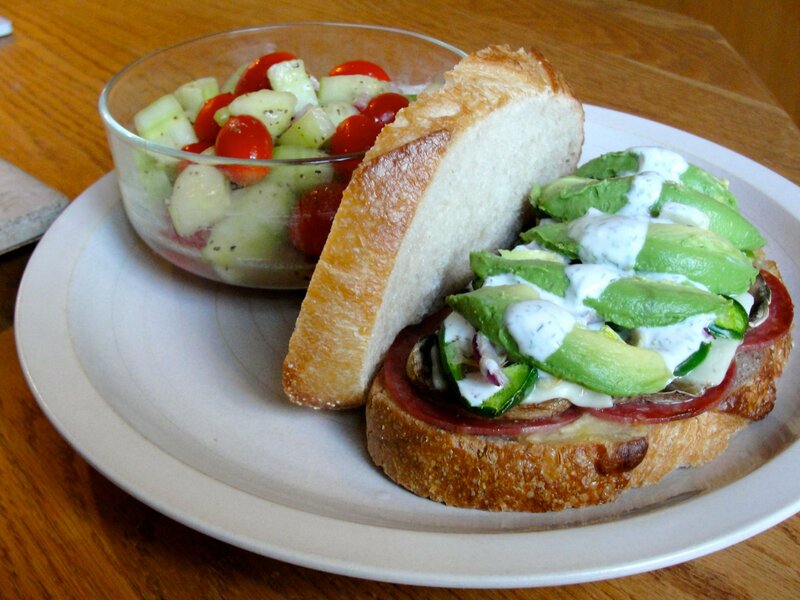 I’ve made these delicious sort of sandwiches a lot… they’re a favorite with lunch guests or to make in the morning (although it’s not fast) and take into work. A Bulgarian friend brought their homemade Kyopolou and someone asked if it was from Trader Joe’s! Yikes.